2 Level 4 monsters. :- Once per turn: You can detach 1 Xyz Material from this card; apply this effect, depending on this card's battle position. 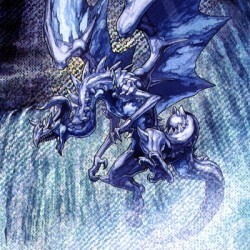 :- Attack Position: If this card attacks an opponent's..
1 Tuner + 1 or more non-Tuner Machine-Type monsters. When this card is Synchro Summoned, you can Special Summon 1 "Karakuri" monster from your Deck. Once per turn, you can select 1 monster on the fiel..
2 Level 8 monsters. Once per turn: You can detach 1 Xyz Material from this card; place 1 String Counter on each face-up monster on the field, except this card. If you do, during your opponent's next E.. If this card is in your hand or Graveyard: You can banish a total of 2 WATER and/or Dragon-Type monsters from your hand and/or Graveyard, except this card; Special Summon this card. During your oppone..